Middle Eastern crude producers set to release monthly selling prices, China’s aluminum prices set to fall further, and activity slows across the commodity sector ahead of the Lunar New Year holidays. Associate editor Kevin Seo talks about these and other factors that could drive commodity prices this week. This week: Middle Eastern crude producers to release monthly selling prices, China’s aluminum prices set to fall further, and activity slows across the commodity sector ahead of the Lunar New Year holidays. First, in oil, major Middle Eastern crude producers are set to release fresh monthly official selling prices this week. Asian refiners are expected to pay close attention to Abu Dhabi National Oil Company's price announcement after it recently slashed its term allocations for March-loading Murban crude. ADNOC is expected to raise its OSP differential for Murban given the tightening supply and healthy middle distillate product margins in Asia, market sources said. In petrochemicals,activity in the butadiene and synthetic rubber markets is expected to be slow this week ahead of the Lunar New Year holidays. Most restocking activity has been finalized and feedstock requirements for February have also been settled. However, butadiene prices are expected to trend higher as steam cracker and butadiene unit maintenance is slated for February. 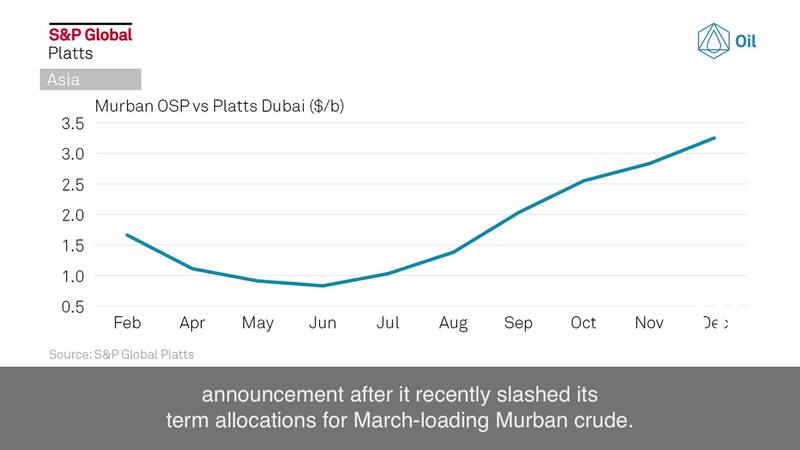 In LNG, the Platts JKM for March slipped last week and recent deals suggest sentiment is turning as winter trading ends and spring demand fails to materialize. Market participants are keeping a close eye on reduced gas flows from the China-Central Asia natural gas pipeline, with some expecting an uptick in Chinese demand as domestic gas shortages increase ahead of the Lunar New Year. In thermal coal, activity in the China market is starting to slow ahead of the Lunar New Year holiday. However, delivered CFR prices for 5,500 NAR cargoes shipped to China are trading at a year high of $98/mt after a cold snap boosted coal-fired generation. In shipping, charterers have pared back bids on both a period basis and single time charter trips as spot demand for grain cargoes out of east coast South America is mostly covered. A lack of coal cargoes within the Pacific is also expected to reduce demand for Panamax vessels in the Asia Pacific this week. In metals, China’s aluminum prices are expected to fall further this week after hitting a 6-week low last week amid rising domestic stockpiles.In contrast, US premiums have surged by almost 30 per cent since the start of the year, which has pushed Japan's spot premiums up more than 12 percent to almost $100 per mt. Will this uptrend continue this week? Join our conversations on Twitter with #PlattsMM.